I love London. Yes, it has it’s downsides – it takes forever to get anywhere because it’s so big, for example – but it’s worth it for the wealth of experiences you get. And one of the reasons I love London in particular is because you never know what you’re going to see from one day to the next; just pottering around the city during your daily life, you can come across the most surreal and mind-boggling sights. So here’s a few of my favourites from the past year (off the top of my head!). What is your favourite/most bizarre London encounter? The man standing on top of a car next to Wandsworth Road… just standing, staring into the middle distance. As you do. The middle-aged woman walking down the King’s Road in Kensington with a parrot on each shoulder. My route home from the bus stop being turned into the set of a low budget zombie movie at 2am. At least I hope it was a movie. Grown men and women running around the Science Museum dressed up as cockroaches, chanting ‘scuttle, scuttle, scuttle’. Apparently this is a regular occurance. This sheep – spotted outside the station in Wimbledon. A woman putting her washing out to dry in the middle of one of the Royal Parks. Walking past a woman that looked the SPIT of Cruella Deville. Stripey hair and everything. That one day when for some reason it seemed that everybody except us was dressed in animal onesies. Except the man wearing a leather business suit. Wandering through Leicester Square one day, when I walked past a man in a suit wearing a Mr Bean mask, holding a teddy bear and dancing on the spot. This was bizarre enough in itself, but about 5 yards away there was a man singing down a traffic cone. Are these the two worst buskers in London? The wonderful ways in which some people travel to work – on rollerblades, children’s scooters and tandems, amongst others – and always whilst wearing a posh suit. Totally what Boris’s Cycle Super Highways should be used for. Book of Mormon…? Book of AWESOME, more like. I know it’s been said many times before, but this really is a great musical. Irreverant, sweet, funny and imaginative, with great songs and great staging. I mean, you couldn’t really ask for much more. I bought the tickets months ago and was super excited, having seen posters declaring rave reviews all over London. I was determined to read / watch / listen to as little of the show as possible before I saw it – in my experience, musicals are always better if you see them for the first time live and with no (or as few as possible) preconceptions about the show – this was certainly the case with Matilda, Wicked, and Avenue Q. But when the designated evening finally rolled around, I was exhausted and grumpy, in the middle of a stressful final week of my PGCE placement, and really didn’t feel in the mood to watch a show full of crude, insensitive jokes about religion and sexuality. I prepared myself to be underwhelmed. 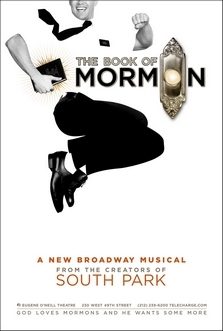 Alongside the comedy, though, there was a surprising depth to The Book of Mormon. There’re the obvious themes about religion and people blindly following faith, but I wasn’t prepared for how much focus there would be on the plight of the Ugandan villagers. There are a couple of genuinely shocking moments of violence, and the writers didn’t shy away (of course!) from more hard-hitting and controversial topics such as AIDs, female mutilation and civil war. In fact, as a tool against such violence and oppression, the over-arching moral of this musical is that religion can be a source of hope, and give people the strength to live their lives in difficult circumstances. Yes, it can seem to make no sense, cause conflict, be based on flimsy circumstantial evidence, and you might not want to take some of the stories too literally… But it does have it’s strengths. And if it’s giving people the strength to stand up to oppressors, it can’t be all bad. Actually, maybe i should have just posted that quote and saved you all the bother of reading this essay. Soz.